One of the high points of last year's Odisha/Orissa trip was visiting Sun Temple at Konark. The name Konark reminds me of Odissi performance in front from Sun Temple in one of those national integration songs in DD in early 90's. Kamats : Since we reached Konark early in the morning, we were looking for a decent restaurant for having breakfast. To our surprise, we found Kamats there. Whether it is the same Kamats as in Bangalore I am not sure. But what caught my attention was the menu items on offer - Indian thali, South Indian thali, Bengali thali, Marwadi thali, Gujurati thali. I could guess any regional thali(meals) but what is a Indian thali in India? The Wheel : Konark Sun temple is a imposing structure, not to forget the intricate carvings which are hallmarks of any ancient Indian temple. What is distinguishing here is the carvings of wheels of the chariot which is driven by Sun god. You can find this as a cultural symbol everywhere you go in Odisha. History (from the ASI board) : The magnificent structure was built in 1250 AD by the Eastern Ganga king Narasimhadeva-I(1238-64 AD) to enshrine an image of Sun(Arka), the patron deity of the place. The entire complex was designed in the form of a huge chariot drawn by seven spirited horses on twelve pairs of exquisitely carved wheels. The sanctum symbolizes the majestic stride of the Sun-god and marks the culmination of the Orissan architectural style. 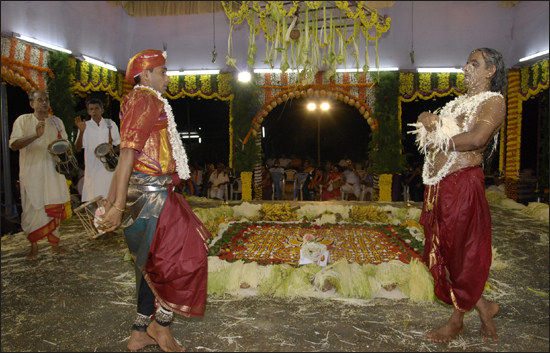 The vimana of the deul has collapsed while that of jagamohana and the nata-mandap are better preserved. The walls of the temple contain superb carvings of divine, semi-divine, human and animal figures amidst floral and geometric ornamentations. Sculptures of mighty simha-gajas welcome the visitors at the porches. One big disappointment in Konark is that you cannot get inside the majestic temple, since it is filled with sand bags by the British to prevent the collapse of the structure! This Vithal Kamat's is a chain different from the one you find in B'lore. These guys mainly serve the dining needs of people in Pune, Mumbai and Goa. They try to make authentic S.Indian food but come pretty close. Thanks Kim for that piece of information.